Back in June, we confirmed that 3DS XL owners would also be able to beef up their handhelds with a specially designed 3DS XL Circle Pad Pro add-on. Now this dream has finally become a reality, as Nintendo of Japan has revealed the first images of the new peripheral. While the 3DS XL CCP has currently only been announced for distribution in Japan, we're sure that it'll approach western shores soon. Not as bad as I thought it would be... but it's still ugly! Forget the XL CPP...where's my XL Charging Cradle, Nintendo? Fankenstick has come back from the dead. Is it really that difficult to add two already built in circle pads Nintendo? @MrWalkieTalkie No, but try explaining to people why the base unit has been made bigger, bulkier and more expensive for no good reason when less than half a dozen games in the entire 3DS library use the additional Circle Pad, L2 and R2 buttons. Then try explaining to consumers who aren't as much in the know why said additionals aren't working when they play Mario Kart 7 or Ocarina of Time 3D. At first I thought the Circle Pad Pro was the ugliest thing ever and at first I thought the 3DS XL was the ugliest thing ever, but surprisingly I really don't mind this. I guess it's because I eventually got used to both. Seriously? Same exact design as the last one? I really thought maybe they would go with a second analog that was almost more of a clip-on since the XL provides alot more room to work with in order to basically hide the additional shoulder buttons underneath and just slap the analog slider in the blank spot below the ABXY buttons. Lame. Can you post a picture of the WiiU Gamepad next to that, I'm curious which is bigger. And a little curious how ridiculous that thumbpad looks next to the buttons rather than over them on the Gamepad. You know, where it should have been when they built the XL in the first place. Couldn't they take a hint from Nyko's Power Grip Pro and design an attachment that doesn't look HORRIFIC? Okay the first one is excusable, but a repeat mistake for the XL? Nuh uh. @RupeeClock I was hoping for them to take a hint there too. The situation is understandable but at least make it look halfway decent. Do you think Nyko will help out with this as well? NOW YOU CAN HAVE A 3DS THAT FINALLY DOESN'T FIT IN YOUR POCKET!!!! @3Dash If people weren't wearing skinny jeans then maybe they'd be able to fit one in their pockets. I wear normal sized pants and there's still a fair amount of room leftover after I put my XL in. People were originally making it out as if it was going to be the size of a 10" tablet. Well, that's true, depends on the size of pants. All winter long I wear pants that can hold 2 nooks, a 3DS, and a handful of 3DS games. Cannot believe it's just as ugly as the original. Oh well, I still need it. @RupeeClock: I am still waiting for Nyko to bring that out for the original 3DS so I can finally play Resident Evil Revelations. Last I heard it was suppose to come out next month. Does the XL work with the stand that came with KI:U? I have absolutely no use for it. The only game I have that is compatible is Metal Gear Solid: Snake Eater 3D & it's heaps easy to play using the 4 face buttons to change the camera imo. Absolutely zero interest in this. Am really glad this is an exclusive, hard to find thing in the west, since if it was on store shelves everywhere in Best Buy, Toys 'R Us, etc., the normal consumer would just be confused and/or think their system needs it when it doesn't. How big is this compared to the Virtual Boy? I can't believe Nintendo ACTUALLY got around to making a Circle Pad Pro for the 3DS XL tbh. Just WOW. I DO NOT see anyone AT ALL buying this no matter how many of these get distributed to stores. whatever happened to the phenomenon we call portability? 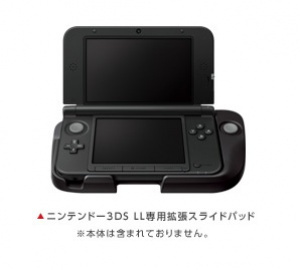 I might buy it for my future Japanese 3DS LL, and I will like it if it's comfy. Still need to get the normal one. Even though Nyko's coming out with their own CPP with lots more functionality, it looks way too sharp and way too uncomfortable. Ai-yai-yai. When people see "Circle Pad Pro", all they see is the circle pad. How about you think about the ZL/ZR buttons, losers. Because if Nintendo built CCP in, it would still be bulky with the 2nd shoulder buttons. I love you CCP, with your circle pad AND your Z-triggers. Well, I'm glad that Nintendo offers this for the users that may want it to play MGS3D on the 3DSXL, but I think I will just stay away from it. I don't get why people complain about the second circle pad not being on the 3DS XL. :/ I mean, having TWO Circle pads is a stupid idea in itself, and not many games use it anyway, plus there are the ZR and ZL buttons, and an R2 button. DO ANY OF YOU REALIZE HOW MASSIVE THAT WOULD BE? It would be another game gear if they tried to shove that all in, as it would take up too much battery. I like the CPP better as it uses a AAA battery for 480 hours. @Vampire-Jekyll: From what I've heard, the stand still works. It shouldn't collapse under the little extra weight. As for this XL themed thing, I won't be getting one once I get an XL. I got one for Kid Icarus: Uprising, and it didn't work the way I thought it would. So, I sent it back and got a different DS game. That, and none of my other 3DS titles support a CPP. @3Dash year round I wear jeans that can hold a 3ds+CCP+the ki:u stand+3 games+my phone(in one pocket). Then a GBA W/ 4 games+a friends phone+my keys+my utility knife. what a joke, Nintendos words "we didnt add an extra circle pad as we did not think it needed one we are happy with how it is"
@MrWalkieTalkie It actually is. They could either have a ridiculously short battery life (those big screens take a lot of power), or make it bigger with analog sticks and extra shoulder buttons. You can remove this. Therefore, this is a better idea. Ugh. Wake me up when a good game comes out that uses this monster. Is every revision of the 3DS over the years going to get a CPP? SIGH... thumb stylus, damn it! Whatever makes mah MH play well. Pretty ugly but will come in handy when I'm playing Monster Hunter 4 and Monster Hunter 3 Ultimate when they come to America. Gonna get it but not gonna like it. Really Nintendo??? Ya couldn't integrate a second circle pad into the XL??? I don't see an XL in my future. I will wait for the 4DS because after the Wii U's GamePad is standardized, I think Nintendo will carry over the double thumbsticks/pads over the next gen DS. To those saying a 3DS with two circle pads is stupid and unnecessary, I assume you will be boycotting the Wii U on those merits? The Circle Pad Pro+3DS is just a sloppily designed Wii U GamePad with two screens. And the Z-triggers could be implemented into the back of the top screen or between the L/R buttons.